Katherine Ayres was already enamored by the legendary world of bears when an encounter with one—coupled with intellectual curiosity—turned an attraction into an obsessive crush. The result is Bear Season: A Journey into Ursidae, a collection of essays that come from her heart and conscience regarding the myriad ways mankind and bear-kind have intersected across time. Intriguing epigraphs preface fascinating explorations of the bear-mystique throughout world history. “We humans protect these large, magnificent giants of the forest so we’ll have more of them to hunt and kill” (5). Such topical revelations ponder the intricacies of how to determine the bear population a territory can support while considering farmers, residents, hunters, and wildlife management agencies. A gruesome example of how parties clash over these issues occurred on December 9, 2013, when an 18-year-old Pennsylvanian-woman was mauled by a mother bear during a deer-hunting expedition. While recovering from her wounds in the hospital, the traumatized woman received a letter from a representative of People for the Ethical Treatment of Animals (PETA). The official suggested that the woman discontinue hunting and consider the terror that animals experience at the hands of hunters. The incident underscores the relevance of Ayres’s book in the ongoing conversation. “President Theodore Roosevelt had been on a hunting expedition, but had not shot a bear. Companions on the trip chased a bear, hounded it, exhausted it and tied it to a tree. When they showed it to Roosevelt, he refused to shoot such a beleaguered creature” (28). The story inspired a toy manufacturer to produce Teddy Bears to commemorate Roosevelt’s presidential pardoning of the badgered beast. Its inclusion reveals Ayres’s ability to parallel external events with internal scrutiny of the concerns that plague these iconic animals. Covering subjects as diverse as dancing bears, endangered species, bear stock markets, and Russian political bears, she seeks answers to the central question: How can people and bears coexist harmoniously? 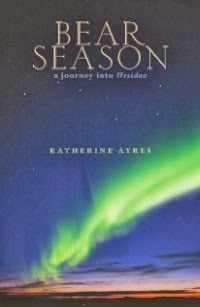 Ayres’s appreciation for the natural world inspires every page as she examines the ecological, global, and personal—searching for the bear’s-eye view without slipping into anthropomorphism. “I realize that I’m drawn to these names—to their scientific accuracy and their musicality. Writers are lovers of words after all—connoisseurs of sound and meaning transcribed into symbol” (24). “The Sun bears, Sloth bears, Spectacled bears and Asian blacks…, also face human poaching and predation for food, folk medicine, and sport hunting, as well as capture to secure animals for performing, fighting and even as pets. As a species, we humans have a very mixed record of living respectfully with our Ursidae neighbors” (40). “Somewhere between eight and ten thousand live bears are currently being farmed in Asia for the production of bile. These bears are obtained as cubs, then caged in enclosures so small that an adult bear cannot fully stand or extend its body. The caged bears have injuries to their heads and faces, and broken teeth from trying to bite through the bars to escape” (154-155). This deplorable practice continues despite the fact that the efficacy of using bile for the treatment of such ailments as hemorrhoids, fevers and alcohol over-indulgence has never been substantiated. Throughout this all-encompassing survey of bears, Ayres’s respect and affection for them is evident. Facts are plentiful—deftly interspersed with answers dispensed at the exact instant questions arise in readers’ minds. By journey’s end, having used research, folklore and anecdotes the author accomplishes her task of raising awareness while creating an entertaining, absorbing, and well-formed portrait of these impressive creatures.